Here's an article I wrote about Andrew Bailey for work. This is the blog post I wrote at work about him. I like the part about baseball cards. I also confessed to him that I collect baseball cards and he didn't laugh over the fun. So, it was fun. New Jersey native Andrew Bailey made it to the MLB All-Star Game. He's 4-1 with a 2.03 ERA and nine saves. Bailey was born in Voorhees and grew up in Medford. He has family scattered throughout southern New Jersey, including grandparents in Brigantine. Premise: Oakland just played the Boston Red Sox, where Nomar Garciaparra made a name for himself. Garciaparra spent parts of nine seasons with the Red Sox and made his return to Boston on Monday. Garciaparra received an amazing ovation from the crowd, showing their appreciation. He never won a World Series with Boston, but was on the team for the start of 2004. What was this weekend like in Boston with Nomar Garciaparra? "That's something I will never forget. Nomar was huge to the Red Sox and for them to embrace him the way they did was amazing. He had a couple of tears in his eyes at the plate. I don't know how he kept his focus. It was something I was proud to be a part of." Premise: Bailey grew up a Phillies fan, went to many games, and watched them on television as much as possible. When do you stop being a fan and realize that it becomes work? "Last year when the Phillies won the World Series, I was jumping up and down celebrating. I was in the Arizona Fall League watching it on TV. At heart, I'm still a Phillies fan, but if we ever play against the Phillies, I'm going to do my job. 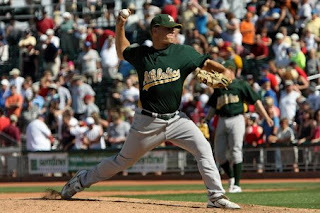 I would consider myself a Phillies fan, but I pitch for the A's. You do lose a little fan in you." Premise: Like many children, Bailey collected baseball cards of his favorite players and team. Children are doing the same with him. How does it feel seeing yourself on a baseball card? "It was crazy the first time I saw myself on a baseball card. A kid asked for an auto and gave me a card. I asked him where did he get it and he gave me one. That was my first card of myself. I try to get at least one card of me that comes out. I think it would make for a cool collection." Premise: Bailey's family has been with him through the whole experience and they travel as often as they can to watch him. How differently do you feel when your parents are in the stands? "I remember when they came out to Anaheim. I was excited for them. They had this dream for me as well to play. When you're sitting in the bullpen, you look out in the stands and you see them. The first game they saw my pitch, I looked at them and I saw they had tears in their eyes. It gets easier down the road as you get more and more confidence." Is it difficult playing on the West Coast away from your family? "No, I've been playing on the West Coast for a while. It's good for my family and friends now because they can just watch the games. They don't have to listen to it on the computer. MLB Extra Innings must love it though because they got a boost in sales." Besides your parents, sister and girlfriend are there any others going to the All-Star Game for you? "I think seven friends from college are flying out. I told them I don't know if I have time to see them. They understand and said to do what I have to do and enjoy it. They just want to be there to hear my name called in the All-Star Game. I still can't believe they are going to call my name." Nice job Sooz, I'm starting to become a fan of this guy. I'm going to pick him up on my fantasy team now.